With competition, new capital entering the market and rising interest rates, multifamily deals are getting harder to pencil. 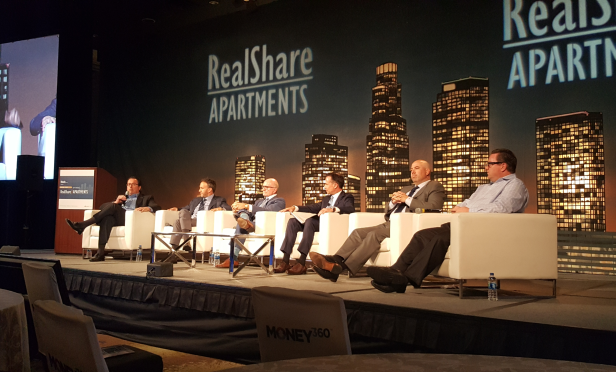 “How are you navigating current market conditions,” asked Mark Renard, executive vice chairman of the capital markets group at Cushman & Wakefield, at the opening of the Transaction Talks: The Art of Multifamily Dealmaking panel at RealShare Apartments this week. For some of the panelists, the response was that the market is challenging today—and it is getting more challenging—but there are still reasons to be excited about the multifamily market, including growing demand and class-B and secondary market rent growth. Renard moderated the panel, which included Tim Hennessey, managing director at PGIM Real Estate; David Schwartz, CEO and chairman at Waterton Associates; Gary Goodman, SVP of acquisitions at Passco Companies; and Mark Deason, managing director and head of US asset management at Starwood Capital Group. Schwartz said that looking at higher borrowing rates and higher exit cap rates based on interest rates, it is becoming more difficult to get a deal done in today’s market. While there are also a lot of positives, including rising rents in the class-B apartment space, improving rents and fundamentals in secondary markets, Schwartz said that capital is flooding into these markets, creating substantial competition. “It is challenging to put money out, and groups like us are going to do fewer deals,” he said on the panel. The crowdfunding platform has a network of more than 175,000 investors and distributed $100 million in returns.